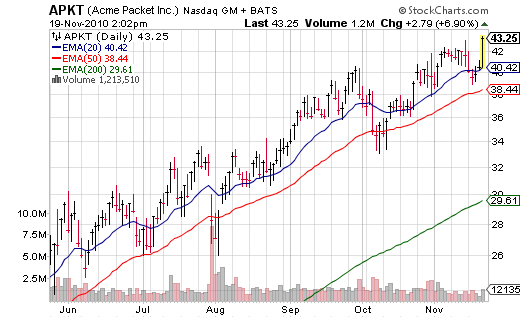 At least there was a reason for what I originally thought to be a random rocketshot move; Acme Packet (APKT) is up 7% on nothing more than an upgrade by Barclays. Boo yaaaahhh. Barclays initiated coverage of Acme Packet (APKT) with an overweight rating and $50 price target and considers the company a critical enabler of the long term migration to VoIP. The bank said that VoIP penetration is very low and growing rapidly, with the percentage of enterprises currently using VoIP services expected to more than double by 2013. For 2010, Barclays sees EPS of $0.79, vs. consensus estimates of $0.76 per share, and 2011 EPS of $1.10, vs. consensus estimates of $1.01 per share. These are not really huge upgrades in EPS, but I guess the $50 price target attracts moths to the flame. Usually I don’t pay much attention to these analyst actions but when it moves the stock this much, have to mention it. Some of those November option players need to send the Barclays analyst a thank you note – while others surely are thinking of hate mail. p.s. the market feels completely devoid of humanoids today. Don’t read much into the action here – it is a lot of chop and flop. Nothing means anything until we break over S&P 1225 or break below this week’s lows and the 50 day moving average down around 1172. Until then – chop fest, but a 50 point one that we are smack dab in the middle of. It’s flip a coin action or in computer terms: 0 or 1 action.